The Great Chazy River has been a tremendous economic engine for the village and town of Champlain. The river winds its way from Upper Chateauguay Lake and Chazy Lake and passes through the town of Mooers and then into the town of Champlain. Boat building in Champlain grew over the years and then accelerated in the 1880s before peaking out around 1910. Champlain Town was known as one of Lake Champlain’s most important boat building locations. With an abundant supply of water and gentle slope, the river was used to float timber to downstream sawmills where they were sawed and placed on sloops and canal boats near the Rapids. By 1862, 20 million feet of lumber was shipped from Champlain to ports in St. Johns or Whitehall for use in house building or to power the steamers on the lake. The need for sturdy boats prompted Champlain’s early industrialists to build their own. The Town of Champlain had at least three boat yards on the Great Chazy River that were used by various partners over a period of 100 years. The largest boat yard was south of the village of Champlain at the end of today’s Gokey Road. This boat yard was built by Royal C. Moore and Timothy Hoyle and was shown as “Moore & Hoyle’s Wharves” on a 1857 map. The second major boat yard was in the Village of Champlain at the end of River Street. This yard was probably first used by the Nyes to build several boats and heavily used starting in 1879 and known as “Kellogg & Averill’s boat yard.” The former “Moore and Hoyle” boat yard and wharves were probably owned by them too. Boat building also occurred at the mouth of the Chazy river on the southern bank. Smaller boat yards were surely built along the river by independent boat builders. In May of 1788, Pliny Moore, along with several workmen and settlers, rowed a boat from the headwaters of Lake Champlain to the Great Chazy River and up to Perrys Mills. Moore showed that the river was navigable by boat for at least four or more miles upstream (the average depth was seven feet up to the village). During that summer, Moore rowed from his mill site to St. Johns, Quebec to buy supplies. In 1797, Elias Dewey and his family sailed for a week on the sloop “Drowning Boy” from Whitehall to Rouses Point when he came to settle. In the 1790s and early 1800s, only a few sloops and schooners were available in Champlain as most people used canoes and small boats (called a bateaux then). The sloops were used by the early settlers to transport grain, lumber and supplies to and from Plattsburgh or St. Johns. Potash, which was a sought after commodity in the early 1800s, was transported to St. Johns for shipment to England by way of Montreal. Sloops were used to move passengers too. It took two days to sail from St. Johns to Burlington in 1808. The trade between the US and Canada on the Lake Champlain-Richelieu River waterway prompted the Quebec government to build the 12 mile Chambly Canal to bypass the rapids on the Richelieu River. Since the time of Samuel de Champlain’s expedition to Lake Champlain in 1609, the rapids here prevented direct passage between Lake Champlain and the St. Lawrence River. The six foot deep canal was started in 1831 and opened in 1843. Previous to that, the 60 mile Champlain Canal near Whitehall, NY, had opened in 1823 and connected Lake Champlain to the Hudson River. With the two canals opened, goods could be transported from the St. Lawrence River to New York City and to all ports in-between. This opened up markets as far away as Quebec City, Ottawa and New York City. Rouses Point became an important customs port for the import of goods from Canada and several docks were built to house the customs houses there. In 1860, the “F.W. Myers” company in Rouses Point was established to handle the customs brokerage business which insured that all import duties were paid by the shippers. The Moore, Nye, Hoyle and Whiteside families were some of Champlain’s earliest industrialists. They operated sawmills, gristmills, owned commercial farms and made many finished products. They needed a good supply of boats to move raw materials to their mills and finished products to market. The earliest commercial boat building project probably dates to 1838. Freeman and Bartlett Nye were merchants and needed boats to ship their products to market. In 1838, they built the schooner “Champlain” and Captain George Brown sailed it between Champlain and Whitehall (an 1841 receipt shows that it transferred supplies at Point au Roche). It is possible the Nyes built the boat on land they owned on the north bank of the river at the end of River Street (the site of the sewage treatment plant today). Bartlett Nye owned the property across the street where his Locust Hill house was built in 1851 (the future Savoy) and his property extended down to the north bank of the river. Not coincidentally, this area became Kellogg and Averill’s boat yard in 1879 and Bill Earl had a boat launch here circa 1909. A 1908 government publication “Merchant Vessels of the United States” listed all of the canal boats and barges registered on Lake Champlain (most of the boats in use had been built between 1880 and 1908). 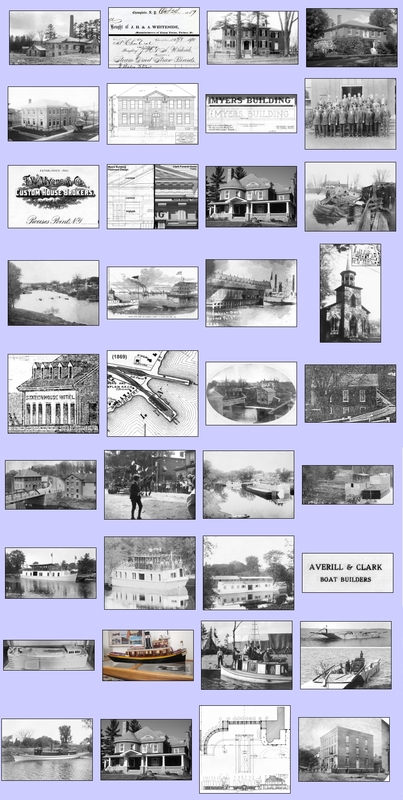 The town of Champlain had 104 canal boats listed as being built since this time with many more built prior to 1880 (many were built by Averill and Kellogg). These boats include the “Henry Hoyle”, “Joseph Lamountain” (1890), “Joseph Allore” (1889), “Leon Robert”, “Armenia Allore” (1882), “J.B. Allore” (1881), “Rosy Allore” (1882), “W.C. Lafountain” (1908), “Frank W. Myers” (1904), “J.R. Myers” (1908) and “F.W. Avery” (1882) shown in a monthly photograph here. Many boats built in Champlain were registered in Plattsburgh or even in Albany and N.Y.C. Joseph A. Allard (spelled “Allore” on the boats) also built several boats including the “T.M. Leonard” (1889), “Annie Gannon” (1892), “Wm. C. Bloomingdale” (1897) and “Laura Allard” (1902). A.B. Spellman, who owned a store on Main Street in downtown Champlain, owned several boats. The “Averill & Clark” boat yards built more than just canal boats. The boat yard also built barges, passenger boats, yachts and houseboats. In 1908, the boat yard built Walter Witherbee’s luxury houseboat “Silouan” which hosted President Taft and his family in July of 1909 during the Tercentenary celebrations in Ticonderoga and Plattsburgh. A primitive gasoline-powered automobile ferry called “The Twins” was also built. The ferry was built in 1905 for William Nelson Sweet and operated between Chazy Landing and Isle la Motte before the Rouses Point bridge was built. The ferry could hold five cars and was named for William’s twin sons Clinton and Gerald. A second 15-car ferry was built in 1916 and he named it the “Twin Boys”. This ferry ran until 1937. A 1910 newspaper article described Sweet’s ferry business: “Capt. Will. Sweet’s gasoline automobile ferry at Chazy Landing is doing a fairly remunerative business. Paring the heavy expenses for advertising and supplies profits would be normal. However, the Captain’s rates are as low as can be expected with an aburdant disposition to please all comers.” The ferry was a well known tourist location and was listed on early car maps. Averill & Clark’s Boatyard at Champlain. View on the Big Chazy River. (Reprint from the Plattsburgh Republican, July 18, 1908). For over a quarter of a century [since about 1883] the making of boats has been an important industry at Champlain, New York, and a large proportion of the canal boats in use on the lake made their first voyages down the big Chazy River from that town. The boatyard, which is owned by Averill & Clark, is located in the valley on the north bank of the river [probably near Gokey Road; see note below]. During the past winter and spring two canal boats have been built, the house boat owned by Hon. Walter C. Witherbee has been completely overhauled and two gasoline engines installed, enabling her to be propelled under her own power, and a new type of gasoline ferryboat has been completed. From 20 to 30 men had been employed in the building of these boats. The work was done during the dull seasons, so that employment was furnished when it was most acceptable. While the yards are busiest during the winter, they are in operation throughout the whole year. One boat is no sooner launched than another is ready to take its place, and so it has been for over thirty years ever since the industry was started by Kellogg and Averill. Long experience in building canal boats has developed a system of completeness in the arrangement of the living quarters of the vessel that would with good reason excite the envy of a city flat dweller. In the few square feet available a kitchen, with its range, pantry and all equipment divides space with bedrooms, dining room and parlor. There is not an inch of space that is not utilize to advantage. The finishing of these cabins is often carried out to suit the individual taste of the owner in case the boat is being built to order, as often happens. Otherwise the same general plan is carried through all the boats. The ferry boat was placed in commission the last of April. The yards are under the general supervision of Mr. John W. Clark, who gives his personal attention to all work that passes through the yard. Edmund Poissant Jr. (probably 1870-1946), is the foreman of the plant and an expert boat builder. The fact that this yard is located in Champlain makes considerable difference in the population as some fifty odd captains make their home there. Most of them own their houses and are counted as among the best and most substantial citizens of the community. JANUARY: The Whiteside Mill, Perrys Mills Road. The abandoned Whiteside flax factory is shown after a morning snowfall. The factory was located between the north bank of the Great Chazy River and the Perrys Mills Road directly opposite Gooley Road....continued. COVER: Coopersville Bridge on Route 9B, circa 1886. This photograph shows a steam dredge removing bridge debris from the Great Chazy River in Coopersville. This was certainly a primitive machine by today’s standards but quite modern compared to Moore and Hoyle’s horse dredge that was used to dredge the Chazy river for many years. This particular dredge had a metal shovel placed at the end of a long wooden boom which was raised and lowered by an iron chain with the help of the steam engine. A man used a large turn-wheel to pivot the shovel. Children watched the action from the north bank. In the background is the old Fesette Hotel building which is now owned by Bryan and Suzanne Moore....continued. FEBRUARY: F.W. Myers Brokerage Company and U.S. Customs House, Lake Street, Rouses Point. "F.W. Myers & Company” was a customs brokerage business. The firm handled customs paperwork for the import of goods into the United States. The company was founded by an Irish immigrant named John Myers who arrived in Rouses Point from Burlington in 1845. Myers worked as an agent for the railroad for 15 years and realized that Rouses Point did not have a customs brokerage business. In 1860, he established a brokerage business with his son, Francis W. Myers (1837-1908) and the business was called “F.W. Myers and Co.”....continued. MARCH: The “F.W. Avery” canal boat is shown lodged against the drawbridge in Coopersville after being swept downstream by ice and water. The boat was pried from its winter mooring, and unfortunately, the draw-bridge had not been rotated. The boat was likely salvaged as it was listed in a 1908 publication. ....continued. APRIL: This photograph was taken prior to 1905 and shows the Lower Bridge and the First National Bank. Most interesting about this photo is the number of people and boats on the Great Chazy river then.....continued. The Station House Hotel was a large railroad depot, steamboat dock and hotel built on a 620 foot long by 100 foot wide wharf in Rouses Point. The Rouses Point Beacon noted that the hotel was the “the mightiest edifice of which Northern New York can boast." The first floor housed the depot, customs house and a large sitting room for guests. A dining saloon was on the second floor along with hotel rooms. It is interesting to note that after a formal meeting of railroad men at the hotel, there was not a dissenting vote on whether to retire to the saloon for drinks. Railroad tracks ran to the depot and a second set of tracks ran from today’s Manor Drive and entered the lake at another wharf a few hundred feet south of the hotel (this is the newly refurbished state dock). In the 1850’s, the Champlain and St. Lawrence Railroad built railroad tracks on 3,000 piers that ran three-quarters of a mile along the shallow shoreline from the hotel down to Champlain Street. At the end of the tracks was another customs house. The tracks and customs house are clearly seen in Ballou’s Pictorial drawing as well as the 1857 Ligowsky map but had been abandoned and removed by 1863. The huge hotel was destroyed by a tornado in 1870. Today, the wharf is filled in with dirt and a road extends to the end of the pier. The pier is owned by the Rouses Point Sportsman’s Club and is located off Montgomery Street. JUNE: The Pliny Moore House and Presbyterian Session House, Village of Champlain. This is one of the most unusual and rarest images showing the Oak Street-Elm Street intersection in the Village of Champlain. The image was made in the 1850’s or early 1860’s and shows a view common to other scenes of this intersection but with many subtle differences and one striking omission. In this view, the First National Bank building is not present nor are any other buildings present here......continued. JULY: Main Street, Village of Champlain The Village of Champlain has always celebrated July 4th with parades and festivities. In this parade on Main Street in 1908 or 1909, a horse is shown pulling a makeshift float. AUGUST: Champlain’s biggest boat yard is shown with a houseboat and canal boat under construction. A barge is moored next to the canal boat. This is one of the best photos seen of this boat yard which was probably at the end of Gokey Road. Behind the boats were numerous buildings that were used for tools and storage. Piles of lumber lay near the boats as well as the partial hull of a future canal boat. Today, there is no trace of any of these buildings. ....continued. SEPTEMBER: A houseboat sits anchored next to a barge at the Averill & Clark boat yard. This boat was shown under construction in the previous month’s image and could be the C.E. Johnson houseboat ‘Winona’ as described here: “The Johnson houseboat ‘Winona’ which has been in the course of construction for the past three months at the Averill and Clark boatyard, left under its own power for Plattsburgh Friday afternoon.”....continued. OCTOBER: The Witherbee Houseboat “Silouan” at the Averill & Clark Boat Yard, 1907-08 In 1907, Hon. Walter Witherbee of Port Henry commissioned the building of a huge houseboat by the Averill & Clark boat yard. The boat yard made many houseboats and yachts for Lake Champlain’s wealthiest residents. Surprisingly, architect Hugh McLellan was asked to design Witherbee’s houseboat. McLellan had only been a practicing architect for about three years in New York City but did work in Champlain, Westport, Rouses Point and other places around the region. An April 1907 blueprint shows the design of the houseboat.....continued. NOVEMBER: Champlain’s canal boats and barges played a prominent role in the 1909 Tercentenary celebrations. Boat builder James Averill conceived of tying together six barges to create a floating exhibit. Starting in February of 1909, he corresponded with L. Armstrong of the Canadian-Pacific Railway in Montreal who was appointed to work with Averill on the exhibit. The budget for the exhibit was $12,000 and an expense list shows the costs of the supplies to make the props (30,000 feet of spruce flooring, Oregon pine, oak timber, spikes, rope, bales of cotton, 125 pounds of white lead, canvass for the painted backdrop, etc.). An elaborate Indian village was designed and built on the barges and 200 Indians from Canada put on a pageant in front of waterfront crowds in Burlington, Isle la Motte, Plattsburgh, Crown Point and Rouses Point. Some of the correspondence centered around taking the barges down to New York City for the Hudson celebrations. An April 1909 newspaper article described the floating pageant: “…Two hundred Indians will be used in the pageant and the marine stage will be built upon six barges which are already under construction at the boat yard of Averill & Clark at Champlain. These barges will be joined together by platforms, making a craft resembling a catamaran. The whole will be transferred into a floating island with rocks, trees, Iroquois log-houses, lodges, etc.” A year after the celebrations Tercentenary committee member Walter Witherbee advertised the barges and told Averill he had a number of inquiries. DECEMBER: “Allason Block” Building, Main Street, Village of Champlain One of the most enduring and still occupied buildings on Main Street is the former “Allason Block” building. The building was built prior to 1862 by William B. Allason who was a businessman, canal boat owner and passenger conductor on the Ogdensburgh and Lake Champlain Railroad until his death that year at the age of 42. The building was passed to his wife, L. Jane Allason, who lived on the hill on Main Street in the house that later became the house of Dr. Hackett (afterwards, it was bought by St. Mary’s church and converted to a convent before it was torn down.) ....continued. 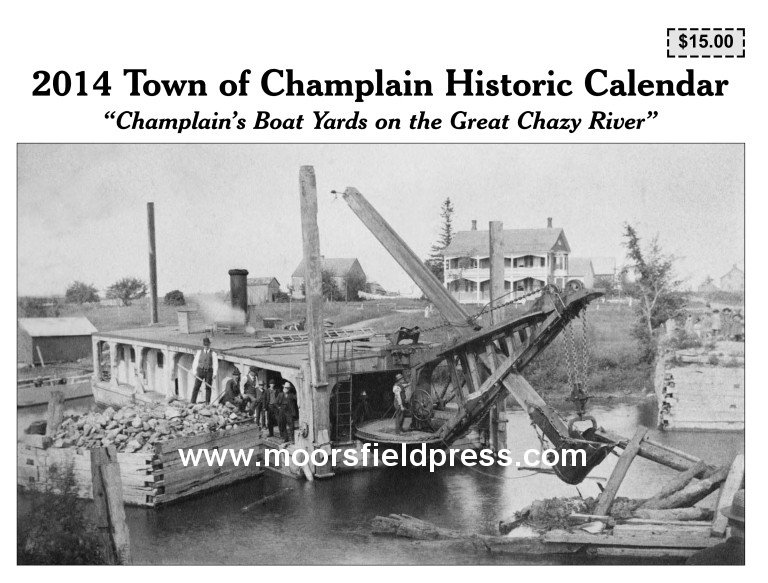 Read about the 2014 Champlain Historic Calendar in a local newspaper. All images in the 2014 calendar are courtesy the Special Collections, Feinberg Library at Plattsburgh State University College, the Clinton County Historical Association in Plattsburgh, the Samuel de History Center in Champlain or the author.